Pets that roam outdoors are prone to numerous traumatic injuries. Fighting with other animals and getting hit by a car are some of the more common injuries we encounter. This page shows a surgical procedure to correct an abdominal hernia in a cat that was hit by a car. In this situation the hernia was caused by a blow to the abdomen by the car. The blow was strong enough to tear a large hole in the abdominal muscles that surround the abdomen. The small intestine went through this hole and was trapped between the muscle and the underside of the skin. This needs to be corrected because the blood supply to the intestines can be compromised while entrapped in this abnormal location. This will cause a segment of the intestines to die with subsequent loss of life possible. This page has graphic surgery pictures. At the end of this page are autopsy (called necropsy in animals) that are also graphic in nature and not suitable for all viewers. To help us determine if there indeed was a hernia we took a radiograph. 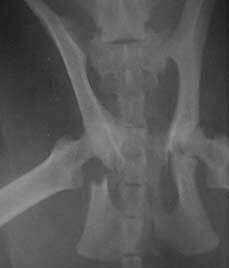 Radiographs are taken for numerous reasons on every pet that is hit by a car. These pets can have trauma to the chest, broken ribs, herniation of abdominal contents into the chest, and ruptured internal organs like the urinary bladder. 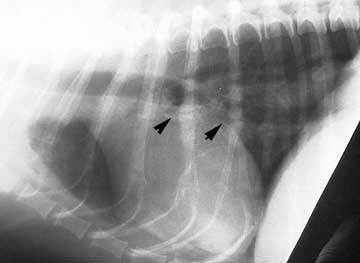 The radiograph helps us determine if any of these problems exist. 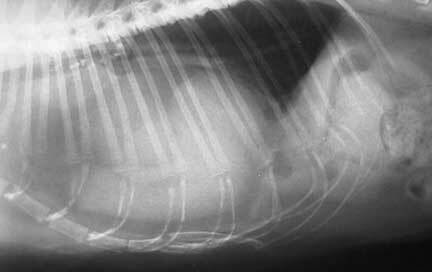 In this case, the radiograph helped verify that Sundance had an abdominal hernia. He also had a fractured pelvis which would heal on its own if he was confined and rested for one month. In addition to an abdominal hernia which you will learn more about soon, animals that are hit by cars also can get a diaphragmatic hernia. In this hernia the abdominal organs like liver or stomach have literally torn through the diaphragm (muscle of respiration) and are sitting in the chest. Needless to say, these are serious injuries. 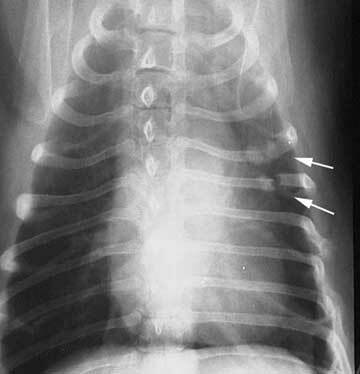 The structures are marked in this normal radiograph or a cat's chest. 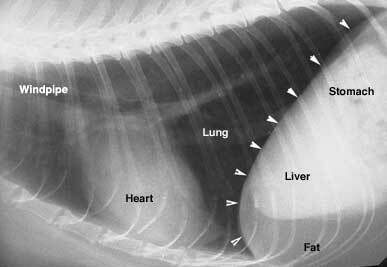 The arrows are pointing to a normal diaphragm. 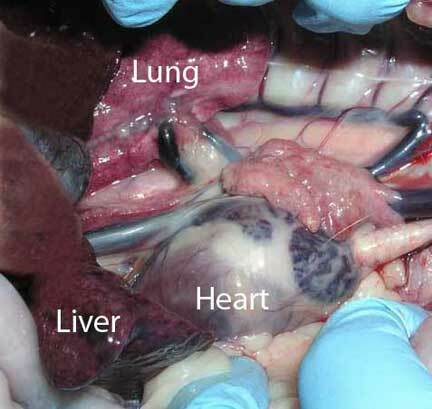 The lungs are all the dark areas. Use them for comparison to the abnormal radiograph that follows. This view of the same chest might help a little. The fractures could easily be missed in the above view, verifying how important it can be to take 2 views. Our exam revealed a swollen and bruised area just under the skin in the right inguinal area, which made us suspicious of a hernia. Bruising is very common in such small animals that have been hit be a car, so it does not necessarily mean there is an abdominal hernia. In most hernia's we make an incision directly over the hernia and proceed to make the repair. In this case the hernia area had extensive swelling due to the fact that it had been present for several days before we saw Sundance. Also, the herniated area was near the area where we routinely make an incision to enter the abdomen for an ovariohysterectomy (spay). In this case it was decided to make an incision directly in the center of the body like a spay surgery, and repair the hernia through this incision. This second arrow in the middle of the body shows the location of our incision into the abdomen. We dissect through the tissue under the skin (called the subcutaneous tissue) until we encounter the rectus sheath, an area where the abdominal muscles come together. This area is very tough, and is used to hold the abdominal muscles together when we sew our patient back together. The rectus sheath can be seen here as the large white glistening area between Dr. P's finger. A horizontal incision is made directly through this layer in order to enter the abdomen and find the hernia. The tear in the abdominal muscles was 4 inches long. It can be visualized here as the horizontal opening towards the bottom of this picture, just under Dr. P's finger. a large segment of the small intestines was found caught in this hole, and was gently removed just prior to this picture. 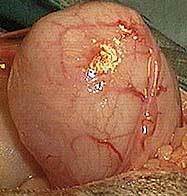 Intestines do not belong in this area, and are easily damaged when trapped in an opening this size, especially for approximately 5 days in this case. In this picture Dr. P is carefully checking them to make sure their blood supply in intact. 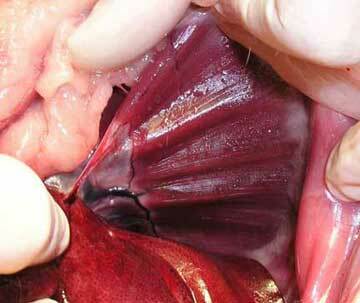 A special suture is used to sew the herniated muscle opening shut. It will provide the strength needed to hold the muscle together until healing is complete. Eventually the suture will dissolve. You can view the partial closure of the opening in this picture as Dr. P sutures the muscle from right to left in the picture. 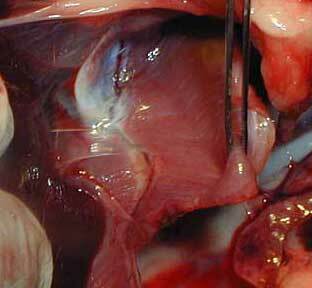 The intestines were not the only abdominal organ trapped in the hole in the muscle. In this picture our surgeon is trimming off a piece of omental tissue that is discolored at the tip. 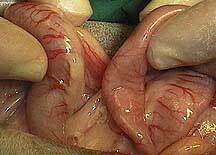 The omentum is tissue that naturally resides in the abdomen. When an abdominal organ is traumatized, as the intestines were in Sundance's case, the omentum migrates to this area and covers the injured tissue to help in the repair process. It is important to check all the abdominal organs for injury. After the unhealthy omental tissue seen above was trimmed, Dr. P methodically went through all the abdominal organs and checked for injury. Here he has exposed the urinary bladder and is looking for any signs of problem. Sundance had no other abdominal organ trauma so his rectus sheath and skin were sutured back together. Here is the 7 inch incision in his abdomen after it has been sutured closed. These sutures will be removed in 7-10 days. The following photos are graphic in nature. To give you a better understanding we have some photos taken at necropsy of a diaphragmatic hernia on a pet that did not make it. This thin, broad, and very strong muscle is the diaphragm. The front side of this muscle is facing the abdomen. On the other side of this muscle is the thorax (chest). You can see the reddish colored liver at the bottom of the picture. 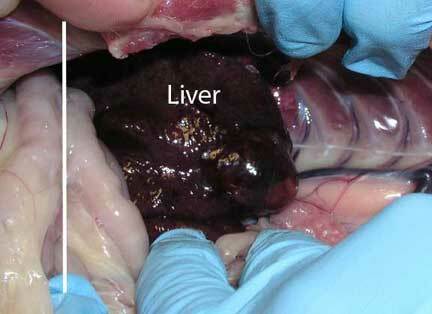 This liver has gone through a torn diaphragm and is now in the thorax. The vertical white line on the left is where the diaphragm was. To the right of this line is the thorax. 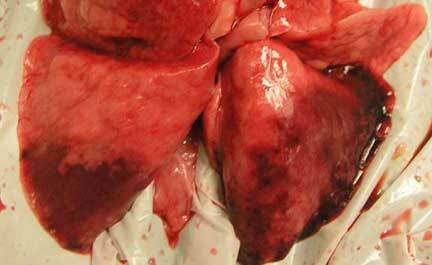 The darker areas of these lung lobes have pulmonary contusion.